Sony bleaches the PS3, and throws in a year of PS Plus for free. If you've been waiting the past six years for Sony to release a white PlayStation 3 to match your blindingly pale entertainment center, January 27 will be your lucky day. Sony has revealed that the first ever white PS3 will debut on the U.S. on that date, complete with a 500GB hard drive. 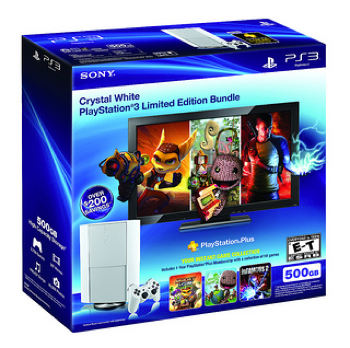 The system will be bundled with a matching DualShock 3 controller and a voucher for 1 year of PlayStation Plus. For a new PS3 owner, the one-year PlayStation Plus membership will be particularly important, as it allows access to a dozen fully features PS3 titles including LittleBigPlanet 2, Super Street Fighter IV, and Infamous 2. The PlayStation system itself is the new top-loading model, with a sliding top door and optional vertical stand. The bundle will be priced at $299.99, and we imagine it'll be available from all the usual big box stores, though Sony's official announcement doesn't mention specific retailers.